Does your space need something to make it pop? Fresh color from Northport Flooring America is your solution when you want to add beauty and value to any area. At our spacious flooring showroom, we make it easy to find the brands you need to accomplish any project involving paint in Akron, OH. Before you begin your next project, visit us for expert advice from our experienced professionals. We have the experience and the expertise necessary to guide you toward the perfect pigment for every room in your home. When you work with us, you can reliably rest assured your home will look its best. There are no hard and fast rules when it comes to deciding which kind of wall color is best for you. The final decision depends on your personal preference and what you hope to create for each room and which home painting supplies work best for your needs and experience level. However, there are some general guidelines to keep in mind to ensure that your design vision translates properly from concept to completion. Remembering these tips will help when it comes to deciding which product is most suitable for your home. Ask our knowledgeable associates for these helpful suggestions when you’re picking out your supplies at our store. Our showroom is proud to offer unique Tribute-brand interior products. Tribute combines the properties of both color and primer to deliver a variety of benefits in just one application. With Tribute, you can forget about stains and mildew. 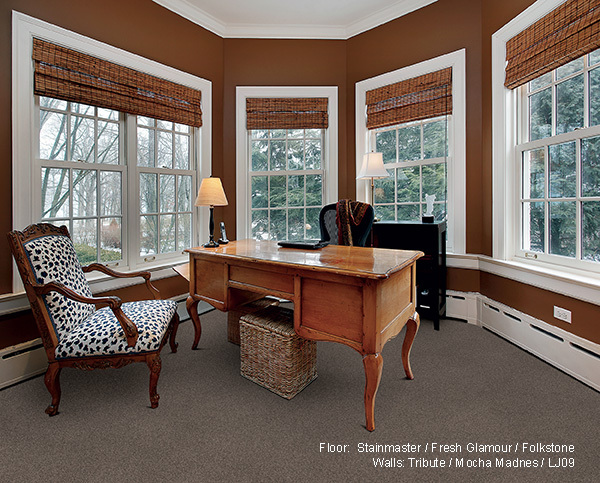 This mildew-resistant paint boasts exceptional stain-blocking properties. Unlike many brands, Tribute is brought to you by the makers of Kilz stain-blocking primers, so you can be confident that any part of your project that uses their products will have a long-lasting, excellent appearance. By partnering with Kilz to offer you the Tribute collection, we are able to bring our clients the very best in specialty pigments. Kilz is known nationally for its commitment to creating products that offer pure, striking colors and reliable coverage. When you purchase Tribute interior product, you receive more than just a flawless finish and exceptional quality. Your paint captures the latest in fashionable colors combined with industry-leading stain-blocking and color-retention technologies. Don’t limit yourself to just improving walls. We offer a range of vibrant flooring options to match the new color in your space. Plus, when it comes to your flooring purchase, we deliver complete confidence with our Lifetime Limited Warranty. This exclusive flooring warranty allows you to make bold choices and achieve the style you want without worrying about the quality of the products you use. From floor to ceiling, you can find the materials, service, and paint you need to make any space come to life and project your personality in every beautiful detail. If you’re unsure what materials and colors pair well together, our showroom experts are always on hand to help out. We give you valuable insight into current trends and timeless design principles. Elevate your home improvement project today by stopping by our showroom. Contact us today to get started on your painting project. We proudly serve Akron, OH, and the surrounding areas.